Europe’s strengthening economy dodged a banana peel when a pro-EU candidate won the first round of the French presidential election. That won’t be enough, however, to make the European Central Bank signal an end to monetary stimulus program on Thursday. Nor will Sunday’s result by itself fix the long-term flaws that have plagued the continent’s shared currency, the euro. 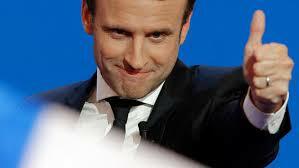 Former Economy Minister Emmanuel Macron, who supports keeping France in the euro, came in first in the presidential vote with 23.9 percent, ahead of anti-euro, anti-EU nationalist Marine Le Pen, who got 21.4 percent. Polls show Macron well ahead of Le Pen in the May 7 runoff. His election would remove a potential stumbling block for the 19-country eurozone: Le Pen’s promise to take France out of the euro could have shaken financial markets and dented the confidence needed for businesses to invest. Yet analysts think that ECB President Mario Draghi will give no sign that the bank is ready to start withdrawing its stimulus support after Thursday’s meeting of the 25-member governing council. They say Draghi won’t want to create any uncertainty for markets before the second round in France is over. The stimulus entails injecting 60 billion euros ($65 billion) a month into the financial system by buying bonds. The purchases are set to run at least through the end of the year, and in any case until inflation shows a convincing turn upward toward the bank’s goal of just under 2 percent considered consisted with a strong economy. The bank has also cut its benchmark interest rate to zero, and started charging a fee on deposits it takes in from banks, in effect pushing them to lend the money to business instead of hoard it. Draghi has said the stimulus is a safeguard against the risk of political events derailing the recovery. The eurozone economy grew by a relatively robust quarterly rate of 0.4 percent in the final three months of last year, but unemployment remains elevated at 9.5 percent and annual inflation is still subdued at 1.5 percent. Ending the bond purchases would have wide-ranging consequences for governments, investors and savers. It would likely lead to higher long-term interest rates, raising costs for borrowers such as governments and home buyers. Higher returns on bank deposits and bonds would mean less incentive to put money in riskier assets such as stocks. He expects the ECB to stick with the language from its March meeting. Then, it underlined that it was open to even more stimulus, if needed. And the bank said risks to the economy were “to the downside,” meaning the economy is viewed as more likely to disappoint than outdo expectations. A change to saying that risks are “balanced” would pave the way for phasing out the bond purchases in the first part of next year. Marco Valli, chief eurozone economist at UniCredit Research, thinks that the bank will change its language at the June 8 meeting, when it will have new forecasts to back up a shift in its stance, and then announce in September that bond purchases will taper off during 2018. And Macron’s election by itself won’t fix the euro. There’s been little movement among European leaders to bolster its resilience to financial crises like the debt woes that pushed member countries to bail out the governments of Greece, Ireland, Portugal, and Cyprus as well as Spain’s banks over 2010-2014. Those fixes could include shared deposit insurance to stabilize banks or some sort of common fiscal pot that could help even things out when trouble strikes in an individual country. The idea would be to replace familiar safety valves lost when countries joined, such as the ability to devalue their currency to juice up exports. Steps involving deeper integration have been stalled by Germany, whose leaders fear that they will be sent the bill for replacing bank deposits when weaker economies like Italy and Greece go sour. Joerg Kraemer, chief economist at Commerzbank, pointed out that between them, Le Pen and left-wing candidate Jean-Luc Melenchon got 41 percent. Both question the euro’s basic set-up.